Here’s my first foray into quilt-making! It’s obviously a beginners’ job but I’m still pretty pleased with it. I made it for my little god-daughter, who is still tiny so thankfully I didn’t have to make it any larger! Still, I had a lot of fun doing it and I’m already thinking ‘king-size double’. So, here’s how I did it…. 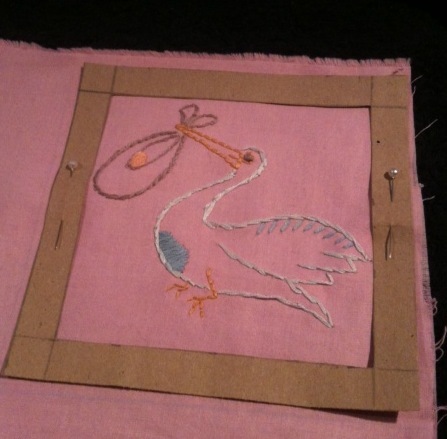 I chose medium-weight plain pink organic cotton to embroider on and chose iron-on designs from Sublime Stitching: Hundreds of Hip Embroideries and How-to (a book I reviewed here), it has a lot of cute baby designs like the crib, rattle and stork I used. I divided the pink fabric into six sections giving plenty of room for seam allowance. (I recommend not cutting the fabric before embroidering because it may not fit in your embroidery hoop!) I then ironed on the designs and started to embroider over them using as much variation in stitch types as I could muster, plus a bit of applique. 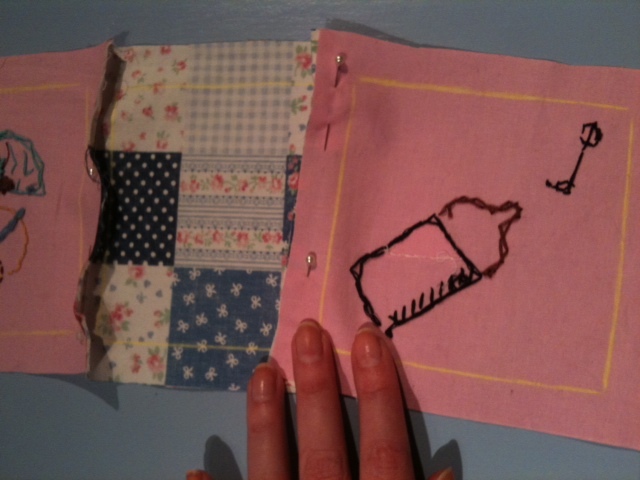 Once I’d embroidered all the designs I made a card frame two centimetres thick as a template. I laid this on the fabric and marked round the inside and outside with chalk to create a cutting line and sewing line with 2 centimetres seam allowance. I then did the same with two pieces of red and white checked fabric and with four pieces of patchwork print fabric, which added to the patch effect. 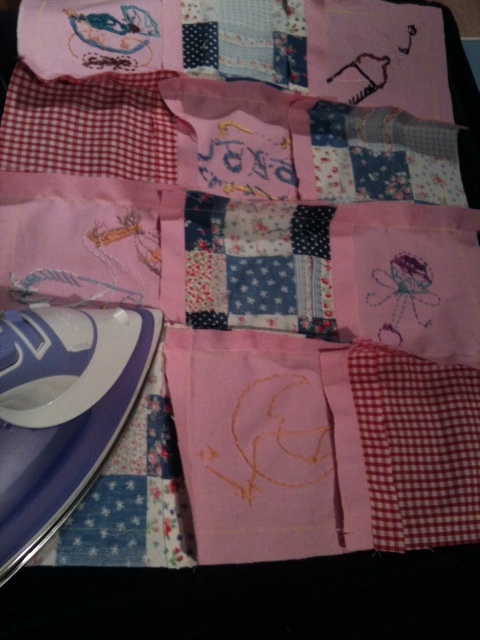 I arranged the squares how I wanted them, pinned a row in place and machine-sewed them one row at a time. I backed the top sheet with a natural, antimicrobial soya-cotton blend quilt wadding (a little wobbly as you’ll see) and trimmed it with pink checked ribbon. Then it was done! 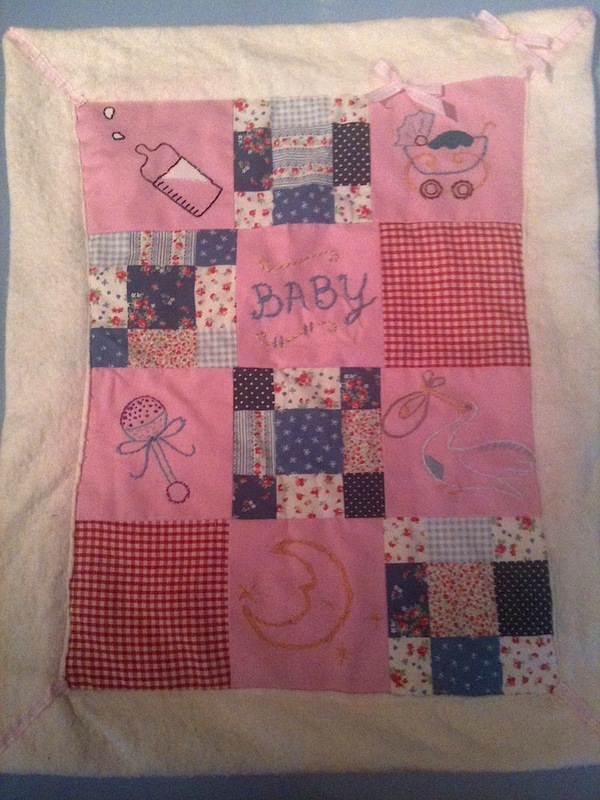 The blanket went down a treat and will hopefully be a nice momento for mum, dad and baba. Picking something small was greater for an introduction to quilting but I’d love to get really good at this. So, if anyone out there has any tips or tricks please let me know! I made this mobile for my god-daughter, Annabelle, as a ‘welcome to the world’ present. 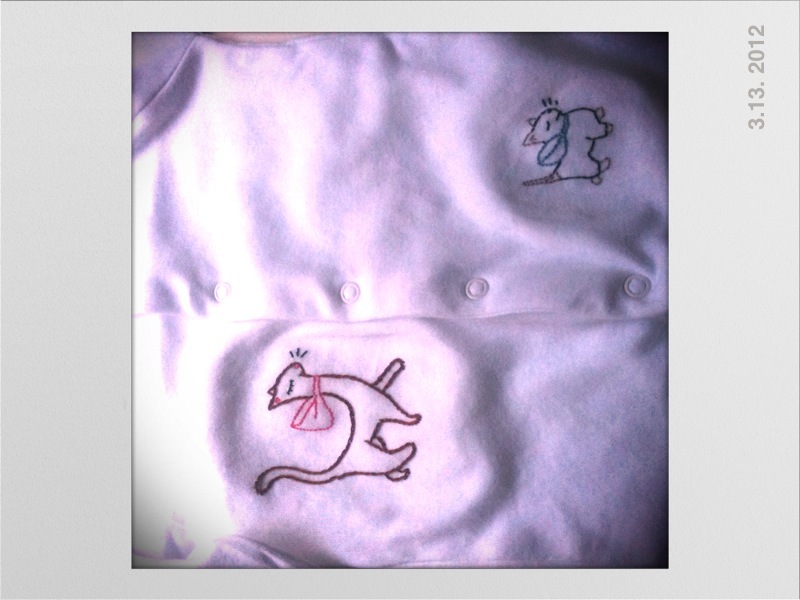 It was actually one of a long list (bibs, booties, embroidered babygrows) and I’m sure there’s plenty more to come. I hope she enjoys using it as much as I did making it. Here’s how I did it. Take the cardboard inner from an old loo roll and cut it in half length-ways and again width-ways so that you have a long semi-circle, or rainbow, shape. Next, carefully stick a length of ribbon against the edge of the loo roll sticking it both on the top and underside of the arch. Trim any excess ribbon. Take another piece of coloured ribbon and stick it next to the first. Repeat until you have used all your ribbon and have created a rainbow effect. Cut any excess cardboard and leave to dry. Take another length of ribbon and sew one end to the centre point of rainbow. If you can’t sew it easily, you may will to glue it instead. You will want a short ribbon on this so that the rainbow hangs high up, preferably out of baby’s reach — while the other shapes are soft and meant for grabbing, this one is delicate and could get misshapen. Using tailors chalk, mark your shape on a piece of felt. Pin the felt to another piece so you have two sides pinned together. Allowing a little extra material around all sides for the seam allowance, cut your doubled-up up felt. Lay your felt on top of each other with the embroidered face touching the other piece of felt, pin in place and sew round leaving a small gap at the top. Turn it right side out and stuff with filling. Use a pencil to poke the stuffing into any small parts if need be. Draw and cut your letter (I used an ‘A’ on each side for Annabelle), tack it to the front of your fabric and sew it in place. You will need to do this twice so that you have a front and a back. Next, draw a cloud shape onto paper, cut this out and use it as a template to mark your fabric. (It’s best not to mark straight on to fabric – it’s trickier than it looks to get the cloud shape right!). Cut your fabric with 1-2 inch excess around all edges for your seam allowance. Here’s the tricky bit. You will need your shapes finished before you can continue. Place one side of your cloud with the letter facing up. Put your shapes on top, directly above the letter, and lay the ribbons out straight down to the bottom of the cloud. You will want the ribbons to poke out lower than the bottom of the fabric. Pin the ribbons in place. Take the other side of your cloud and lay it face down on top, making sure that it is not upside down and the letters are directly facing each other. Pin in place so that the shapes are inside. Sew around the edges leaving a gap at the top so that you can turn it right side out (remember it has to be big enough to fit the shapes!) Turn it right side out and remove the pins from the ribbons. The shapes should fall straight from the bottom cloud. It not (and this happened it me) stitch the longer side of the ribbon to the bottom of the cloud to straight it up. Stuff the cloud with filling and sew up the top adding a loop of ribbon so that you can hang it. Of course, you don’t have to make a cloud — I just wanted something related to the sky. Perhaps you can make something based on what the parents like, or a family tree with the name of each family member sewn onto a branch. 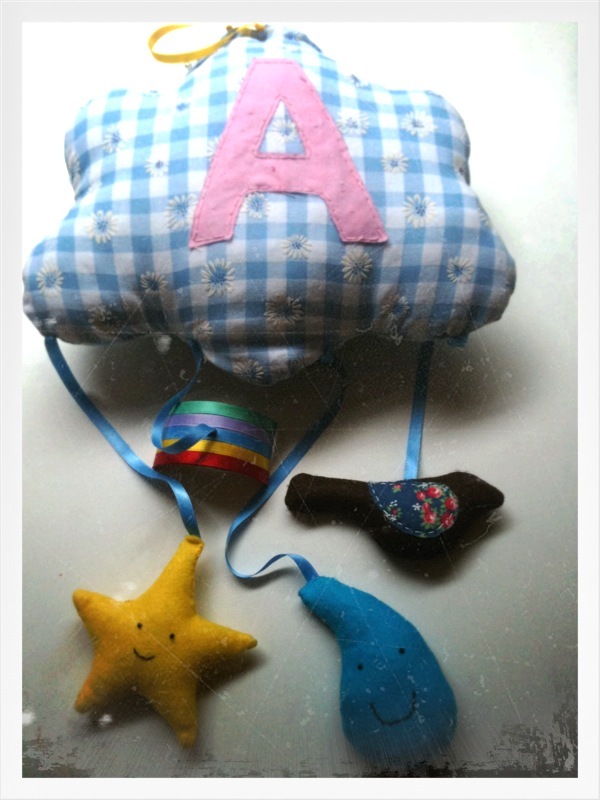 Here’s another homemade effort for little Annabelle, the daughter of a good friend of mine. 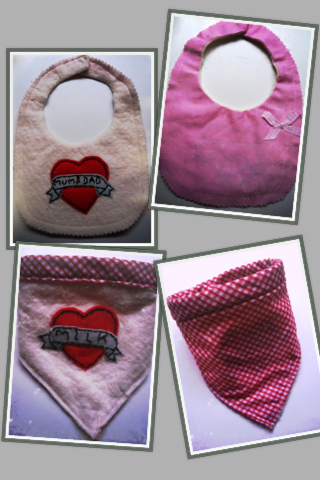 These bibs are reversible, meaning two for the effort of one and, if mum is run ragged, a little bit less washing. I tried a couple of designs, as you’ll see below. To start, measure and mark your fabric. To do this you will need to know the circumference of the baby’s neck. I made this before Annabelle was born so I used a circumference of 14″/36 cms (a baby’s neck is on average 12-14″). Then mark the shape of the rest of the bib with tailors chalk on both pieces of fabric and cut this out. Make sure to snip the top of the bib where the two sides will join with a popper. 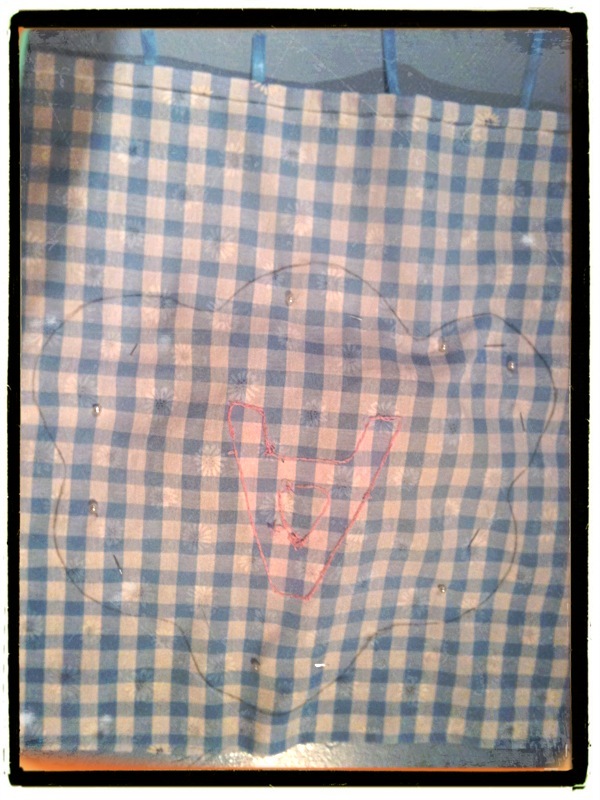 Next mark and cut your applique shape — I used a tattoo style heart and ribbon. Once you have cut these, pin them to one piece of your fabric, sew around the edge of your shape and sew your words if you are including them. If you would like you decorate the other side of the fabric, now’s the time to do it. I simply sewed a matching bow to the reverse side. Place the two pieces of fabric together with the faces meeting and pin them together. Sew around the circumference of the neck, then turn the fabric right-side out and iron flat. This will create a smooth seam that won’t rub baby’s neck. 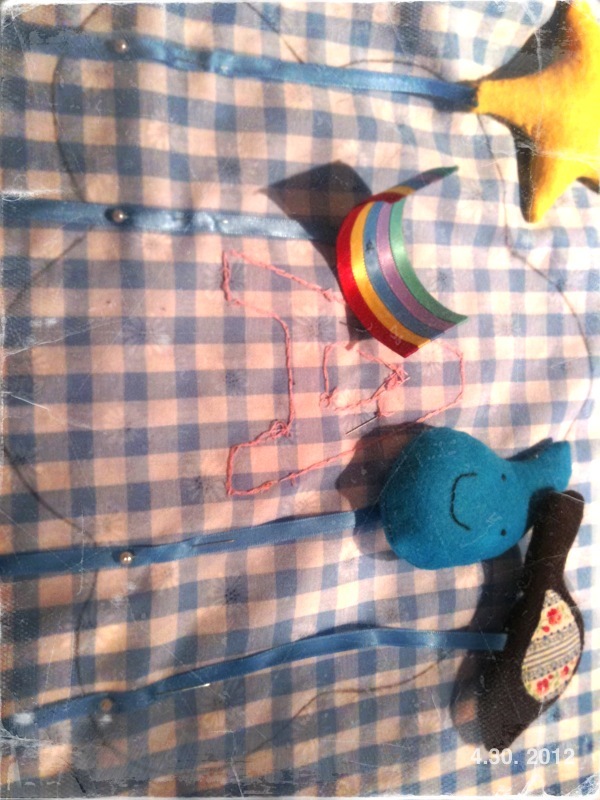 Next, sew your poppers or velcro onto each side the top of the bib where the two sides will join. Then sew round the edge of the rest of the bib and trim using pinking shears to produce a fun edge and stop any fraying. I also sewed a napkin style bib using a simple triangle shape (right) and folded the backing fabric over to create a contrasting top. My future god-daughter, beautiful little Annabelle, was born yesterday! (Whoop! Welcome Annabelle!) So I thought I’d post about a recent project I did for her. 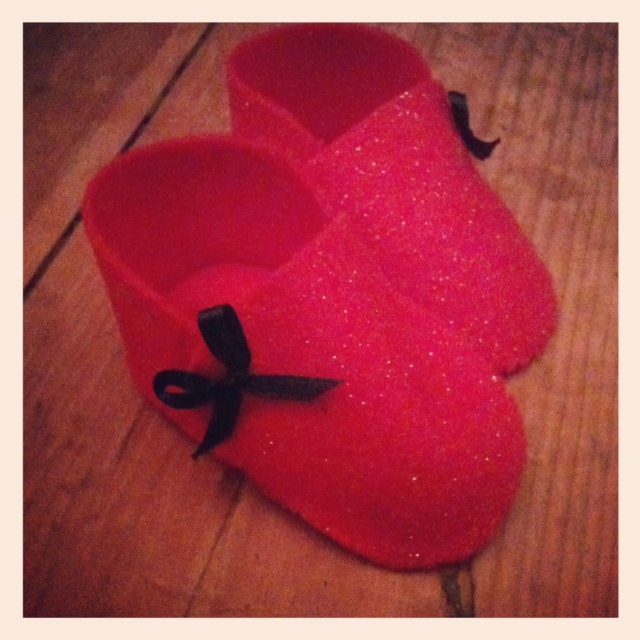 I found the template for these sweet baby booties on Cross Stitcher. 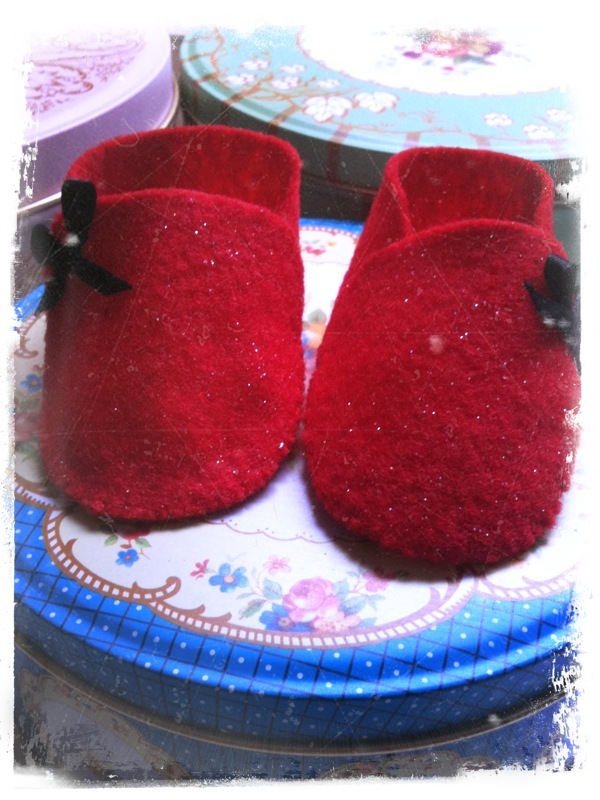 They are very easy to make and you can whip a pair up in a surprisingly short time. I veered slightly from the suggestions in Cross Stitcher; I went for plain instead of embroidered; I used a tiny ribbon bow instead of buttons for decoration; and I added a popper on the outer side (beneath the bow) to make sure the booties don’t slip off her tiny feet. I think these are adorable, so cute in fact that I’ve not been able to wrap them up but have left them on the sideboard where I can coo at them! Now she’s finally here it’ll be worth parting with them though! I made these on the train to work and was quite proud to hear a lady next to me tell me they are “so cute”. Then again, anything baby-sized will tug at your heart-strings. I’ll be testing the cute v’s size argument soon because my boyfriend has asked me to make a man-sized pair for him as slippers. I will stick proper soles to his as unlike little Annabelle, he has mastered the use of his legs and I don’t think felt could withstand the wear and tear of walking. I’ll blog soon to let you know how it goes. 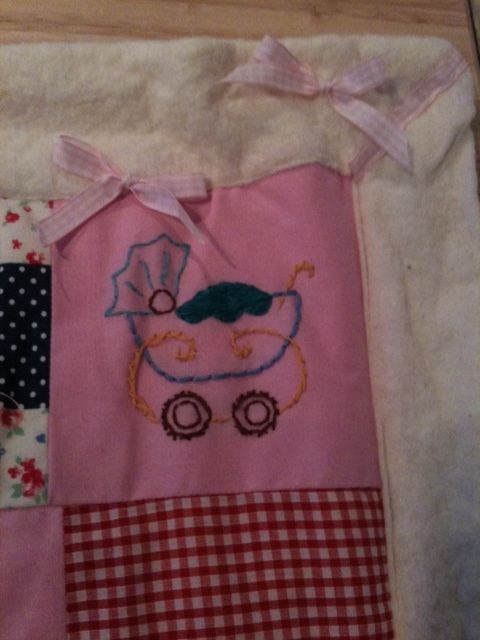 I’ll also post soon about the other treats I’ve made Annabelle, including a mobile and baby blanket. 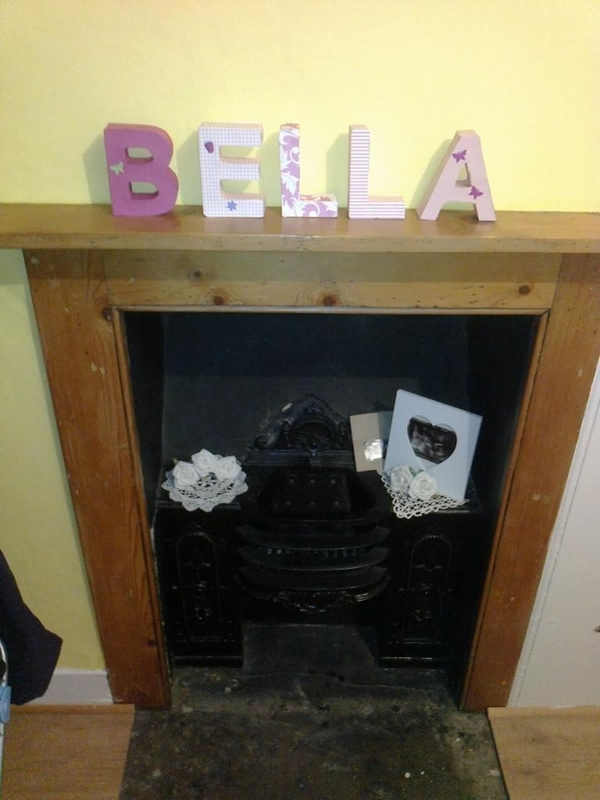 I was out with a friend recently when we spotted a stall selling letters — you know the kind, you pick your letters to spell whatever you want and then use it to decorate your home. I had wanted some myself but with an already cluttered home, I opted out. My friend though, was eager for some to decorate the nursery of her soon-to-arrive daughter, Annabelle. 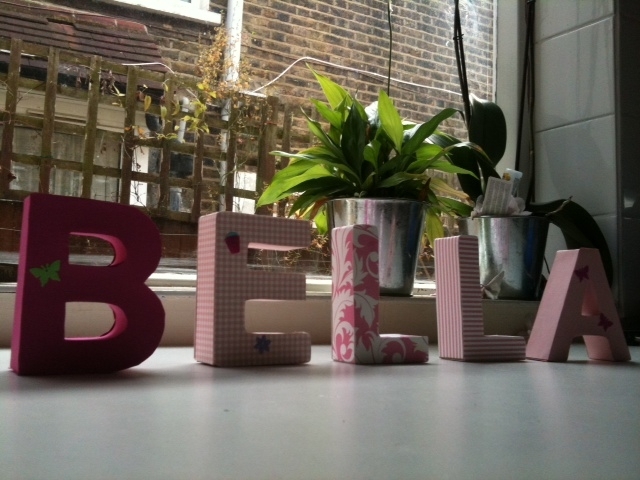 But at £9 a pop, she wasn’t keen on spelling the whole name (£81 for cardboard letters, anyone?) and I knew I could produce the same thing much cheaper. Eager to take on (yet another) craft project, I headed to the local craft shop where these letters in their dull brown form were £3.85 each. That’s more like it! I used the plain letters I had bought as a template, tracing the shape on the card, then cutting the shape and gluing it to the front and the back. (If you’re trying this, don’t forget you want the letter for the front to be the right way round, and for the back a mirror image). For the sides, I measured the width of the edge, cut a strip of the same width and glued that all the way around. I decorated the letters using card and a variety of sequins, but you could use paint, fabric, paper or whatever you fancy — and if they are for a child, why not get them involved too. 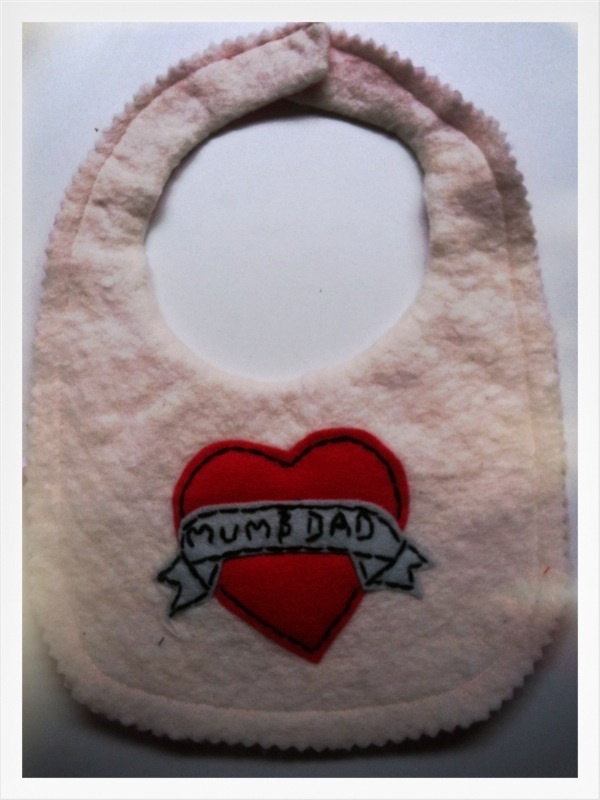 There are so many cute presents you can buy for a baby or expectant parent, but they will never mean as much as something handmade and personal. As you’ll see from my other posts, making baby items is so rewarding it becomes a little addictive; not only does it give you pleasure producing and giving something so cute, but it’s great to know they will be used and appreciated. 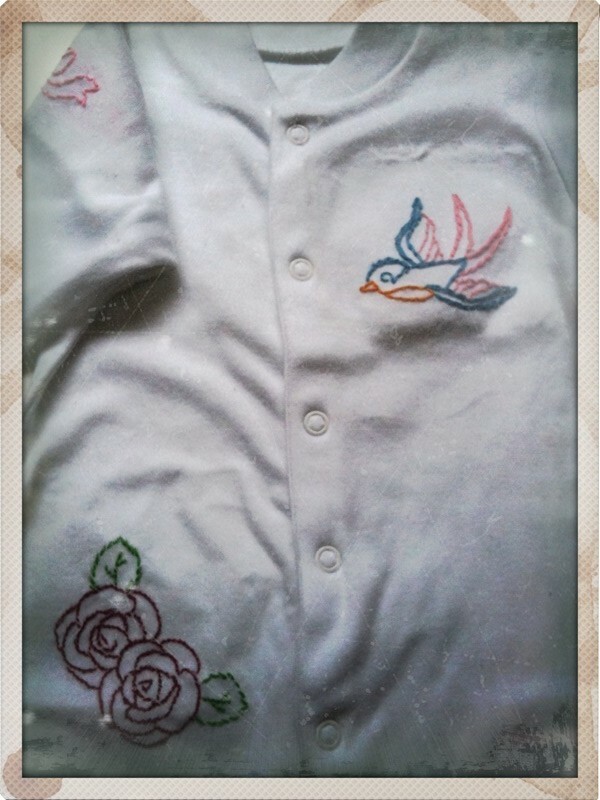 Embroidering is a cheap and relatively quick way to personalise anything from a towel to a jumper, or a bag to brooch. Here I have used Sublime Stitching’s embroidery patterns, which made the process even easier. I will talk more about Sublime Stitching in other posts as it’s a company I thoroughly recommend. 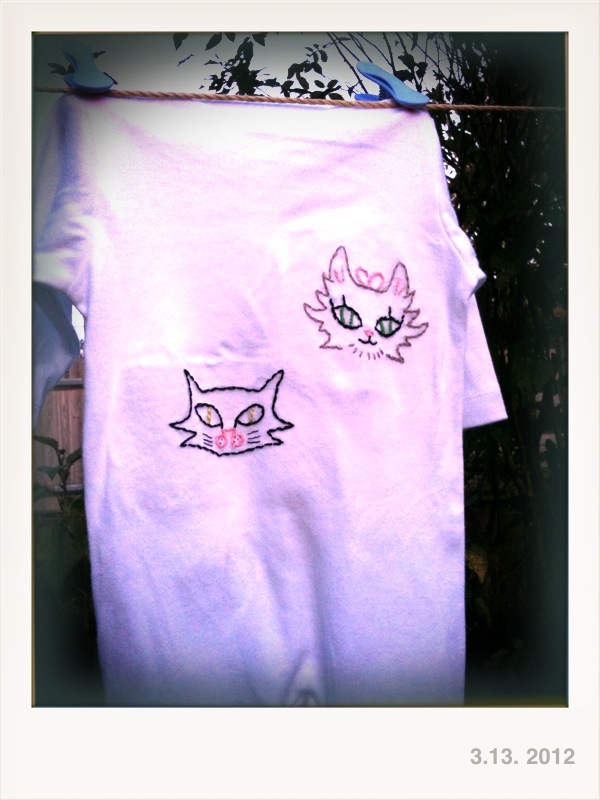 The founder, Jenny Hart, creates extremely cute, modern designs that you iron on to fabric and embroider over. Great for those who are creative but a bit artistically challenged. The kit you buy from Sublime Stitching will give you full instructions but it’s like any other iron on — simply prep your fabric by ironing it (the heat makes the ink take better). Then pop on your design face down and press the hot iron over making sure your design doesn’t slip. Because the fabric of the baby grow is stretchy I first ironed some Wonderweb onto the back of the fabric to give it some support. 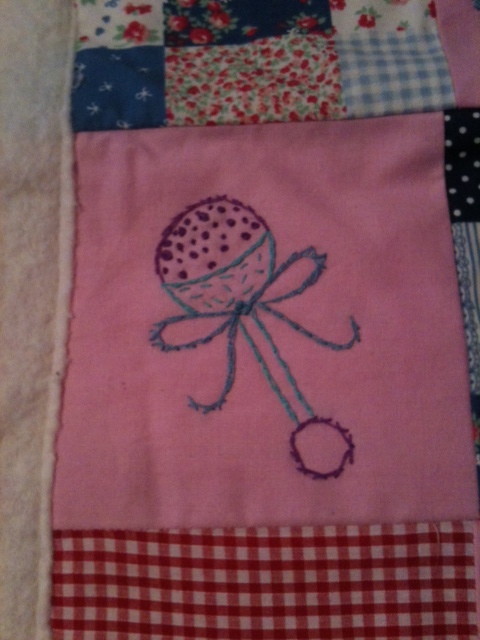 I used a 6 inch diameter embroidery hoop and the usual embroidery threads in a range of colours and stitches. Once I was done, I ironed on another layer of Wonderweb over the old patch. This secured all the threads and gave a neat, professional finish and meant baba’s tiny fingers would not get caught up in any loose threads. A warning here! When ironing the second piece of Wonderweb make sure it is bigger and completely covers the first patch or the iron will melt the webbing that’s already there making dirty marks on your fabric and your iron. The designs I’ve here are re-useable. I used them on a patchwork baby blanket and a blanket I embroidered as a wedding gift, so you will see them pop up a lot on this blog! Freebie alert! You can get a free download of Sublime Stitching’s totes amaze retro tattoo patterns here from Mollie Makes craft magazine. Enjoy!